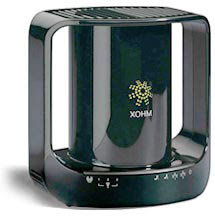 Comrex Road Warriors - Live & Local: Comrex ACCESS on the XOHM WiMax Network: WOW! Comrex ACCESS on the XOHM WiMax Network: WOW! ACCESS Tested on Xohm WiMAX! We’ve long heard rumors of a new, ubiquitous wireless data network on the way called WiMAX, and have been longing to spec out its performance using ACCESS IP codecs. 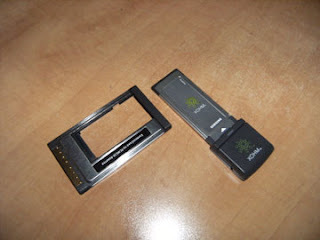 I got my chance recently when I received a WiMAX Express card for testing. The first widespread commercial deployment of WiMAX technology is coming from a division of Sprint Wireless dubbed Xohm. They currently offer commercial service in the Baltimore market only, with several other cities coming on-line around the end of 2008. After enough begging, we got hold of a sample card, shown below, with intention of 1) finding a way to have ACCESS Portable utilize the card and 2) finding a friendly broadcaster in the Baltimore are to help us spec it out. As it turns out, the card offers literally no Linux support at this time, so the project of including direct support for it was shelved for a different day. For future tests, I’ll recommend using the available external modem, which should theoretically have no such interface issues. It may have an advantage as well, since building penetration at the 2.5 GHz frequency used by Xohm can sometimes be challenging. Utilizing the external modem would allow you to position it near a window, and run an Ethernet cable to where the action is. Before I booked my flight to Baltimore, a little Googling produced some reports that Baltimore WiMAX users have migrated to some other “soon to be covered” cities and had success with their Xohm hardware there. Since one of the reported cities was Boston, I ventured out on a little site survey to see if I could conduct the testing closer to home. Lo and behold, the card in my laptop lit up in various areas in the city and around the Route 128 technology corridor. Fig 3- This will be easier than I thought!